Alverde’s rich formula contains pomegranate seed oil and Shea butter*, which smooths the hands skin in seconds. Looking at the ingredients list, this hand cream has sunflower oil on a second position and glycerine, both known for its hydrating action. This cream has been given to me from my family member on my visit, as I forgot my hand cream with me and my hands were very dry of hard water and cold outside. 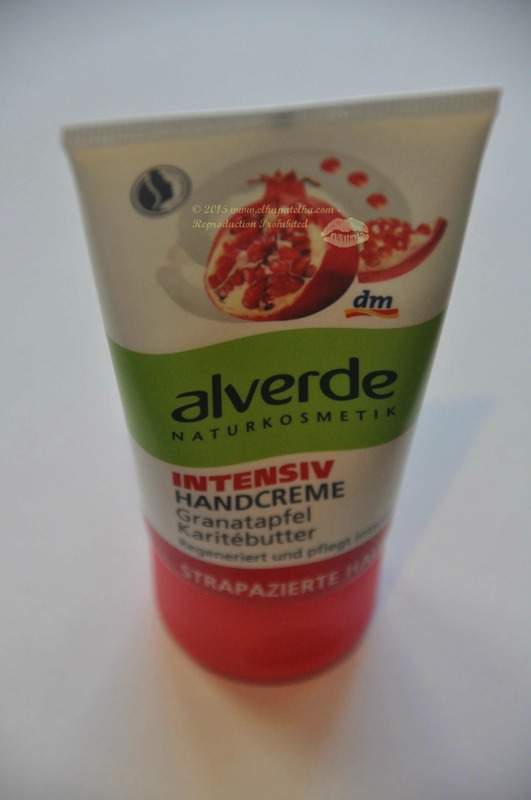 I just love a scent of Alverde Intensive Pomegranate Hand Cream. Its just amazing,elegant, subtle, floral. 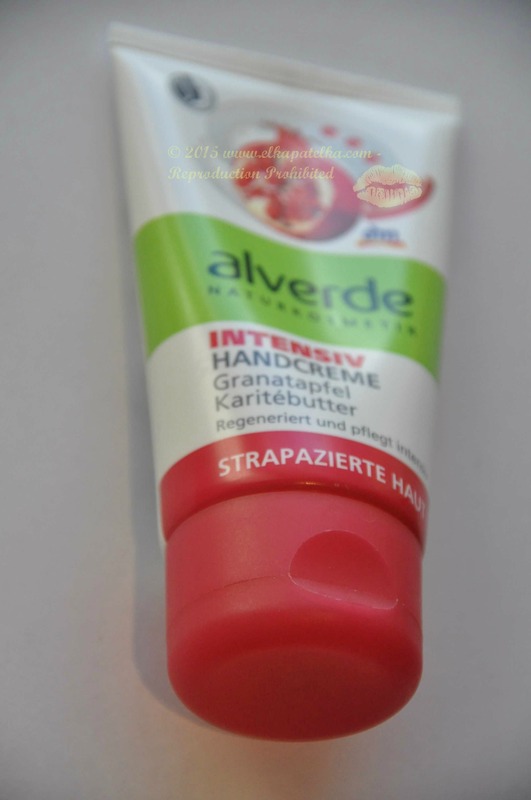 Alverde Intensiv Handcreme Granatapfel became one of my favourite hand creams from the first use. It is packed in a small soft tube, which you can take anywhere with you in your handbag. Moreover, you do not need a lot of cream to have it work. 75ml can be finished very quickly though-that is a downside of that product, but it is sold only in one size. My friend recommended me some time ago Neutrogena hand cream, which most of you surely know. It is good, but its heavy vaseline consistency, which makes your hands sticky for so long is not for me. And the smell of Neutrogena- a hospital smell-not a nice experience at all, but it was working. Alverde Intensive Handcreme Granatapfel pampers not only your hands but senses with its incredible smell. It soaks in very quickly leaving hands smooth with an elegant flower scent. Its price is very affordable, like most dm Drogerie cosmetics. Give it a try if you have a chance to shop at dm Drogerie. *Shea butter-known as well as Karite butter, is an oil extracted from the karite tree fruits. It is used mostly in cosmetics as a skin moisturiser as it is rich in A and E vitamins. Shea butter has anti-inflammatory and anti-microbial properties. Lets make sure our hands are smooth and soft.. This entry was posted in Alverde, Hands and nails care and tagged Alverde, Alverde Intensiv Handcreme Granatapfel, hand cream, hand creams, hands quotes, heavy duty hand cream, intensive hand cream, Neutrogena hand cream, pomegranate seed oil, sensitive hands, vegan hand cream.